Hidden pockets of wilderness still exist within the urban environs of New York City, and in <i>Legacy</i> Joel Meyerowitz invites us to discover them. 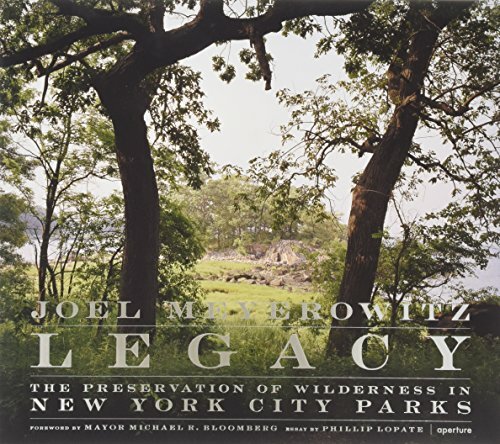 This beautiful body of work is the result of a unique commission Meyerowitz received from the New York City Department of Parks &amp; Recreation to document the city's parks. During the course of this project, Meyerowitz honed in on the 8,700 acres within the five boroughs of New York City that still exist in their original pristine state, as well as areas within parks that have been left to revert to wilderness. In creating this work, Meyerowitz has drawn on his own childhood memories of a New York that included &quot;green space--open and wild, alive with rabbits, migratory birds, snakes, frogs and the occasional skunk--[that] gave me my first sense of the natural world, its temperament and its seasons, its unpredictability and its mystery.&quot; Through this rich compendium of images of parks, shorelines and forests, Meyerowitz's magnificent project transports the viewer into the heart of a lush wilderness, while contextualizing these nooks of nature as an inextricable part of city life today.<br /><b>Joel Meyerowitz</b> (born in New York, 1938) is an award-winning photographer whose work has appeared in over 350 exhibitions in museums and galleries around the world. He is a two-time Guggenheim fellow, a recipient of both NEA and NEH awards, as well as a recipient of the Deutscher Fotobuchpreis. He has published over 15 books, including <i>Cape Light</i> (1978) and <i>Aftermath: The World Trade Center Archive</i> (2006). He lives in New York.